The Gujjars and Bakarwals is a unique ethnic group which migrates in the Western Himalayas. 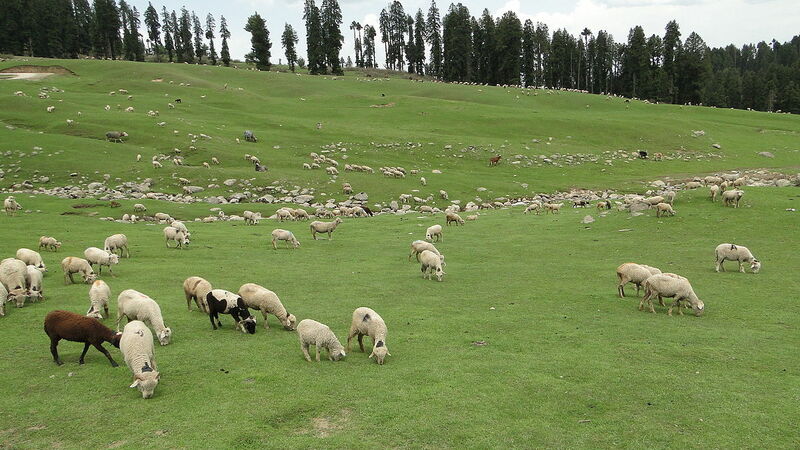 They are the sheep and goat rearing transhumant’s who oscillate with their rewards (flock) between high and low altitudes in the mountains, lands and valleys of the Jammu & Kashmir State. The habitat of these people is in the hilly terrain of the North-Western Himalayas. The Gujjar-Bakarwals claim a common ancestry from the ancient Gujjar tribe of India. Some of the scholars are of the opinion that they are the foreign stock representing the pastoral nomads of Central Asia. Some of them are of the opinion that the Gujjars are the descendants of the Kushan and the Yuchi tribes of Eastern Tatars (Russia). Some scholars hold the view that they are of Indian origin. One of the major traditions of the Gurji (Georgians) people is that they used to give their tribal name to the places and localities they inhabited. It is strongly believed that before their march to the Subcontinent of India, they occupied some places in Iran, Central Asia and Afghanistan. These areas are known as Juzrs or Jurz, Gujar, Guru, Gurjistan, Gujar Khas and Chausak Gujar. When they came to India, they named certain areas as Gujranwala (a district in Pakistan), Gujarat (West India), Gujargarh (Gwalior) and Gujarat (Saharanpur, Uttar Pradesh). Many smaller places also have their names after Gujjars. The Census of India, 1941 observes about the advent of the Gujjars of Kashmir. It is believed that the part of the tribe migrated towards the state of Jammu & Kashmir after the outbreak of a serious famine in Rajasthan and Gujarat. It is assumed that at the time of their migration was the time of Satahsiya famine. Some sections of the migrating tribe moved to the plains of Punjab, while the others moved further north to the region of Kagan, Swat, Hazara and Kashmir. The Gujjars now living in the state are parts of two separate migrations, one direct from the Gujjar tribe of Rajasthan and Gujarat, and the other who migrated later from the Gujjar tribe settled in the plains of Punjab. The Gujjar families now living in Rajouri, Reasi, Jammu, Poonch and Kathua (Jammu Division) claim their ancestors from the Gujarat district of Pakistan, who migrated to these hills after the outbreak of serious famine there. In their folk tales, they say that their ancestors came to these areas about seven or eight generations back (perhaps in the beginning of 19th century) from the valley of Kunhar and the valley of Illahiwal in search of pastures. They also claim that prior to the partition of the country (1947) they used to visit their relatives and join them on occasions of marriages and funerals. The geo-climatic conditions in the mountainous areas of Jammu & Kashmir vary from the Arctic cold of Ladakh in winters to the tropical heat of Poonch and Jammu in summers. There are micro-level variations in the average annual rainfall too which vary from season to season and month to month at the various rainfall recording stations. Moving northward from the south, the rainfall gradually decreases and the station of Leh (Ladakh) records only about 10 mm rainfall annually. The southern parts of the habitat receive rainfall mainly from the summer monsoons which generally arrive in the region in the first week of July and retreats in the middle of September. In the valley of Kashmir, Ladakh Division and Middle Himalayas of the Jammu Division, the rainfall occurs mainly from the western disturbances, having their origin in the Mediterranean Sea, during the winter season (November to April). Moreover, in the winter season, snowfall is recorded in those areas which are more than 1,250 metres above the sea level. The occurrence and quantity of snow influences substantially the economy and life style of the Gujjars and Bakarwals. Thus, the sharp variations in climatic conditions in this mountainous habitat lead to seasonal oscillation for economic activities. When the high mountains and their pastures come under snow during winter season, the southern hills of Jammu Division provide ideal conditions for grazing the herds. Contrary to this, in the summer season, when the outer hills of the south are parched under scorching heat, the pasturage is available at the higher altitudes in the mountains of the north. The Distribution of Annual Rainfall in India – Explained!